If you have a lot of categories and only a few tags, then one of the quickest ways to generate a lot of relevant tags is to use the WordPress Categories to Tags tool. This tool can be used to convert categories to tags or vice versa. Remember that if you're creating tags, you should carefully consider the tags you generate if you are adding to an existing set of flags. Tags and categories should relevant to the content that you are showing to your users. There are two ways to get to the Categories to Tags tool for setup: using the link in the Posts or Categories page or using the link in the Tools menu in the WordPress Administrator. If the tool has not been installed, then you will need to go through the installation process which is the same as installing a plugin. Login to the WordPress Administrator. When you click on the link and you're installing the tool for the first time, you will see the landing page for the Categories to Tags Converter tool. Click on Install now to start the install. Click on Activate and Run Importer after the plugin finishes installing. At this point the tool will have been installed and you will see the main conversion screen. The number of tags you can create is based on the number of categories listed. The following tutorial starts with screen that you see after you finish the installation above. You can also reach the same screen by going into the Tools Menu when logged into the WordPress Administrator. The following instructions will show the conversion from Categories to Tags, but you can use the same instructions to convert Tags into Categories. Click on Check All or select the categories (or tags) that you want to convert. 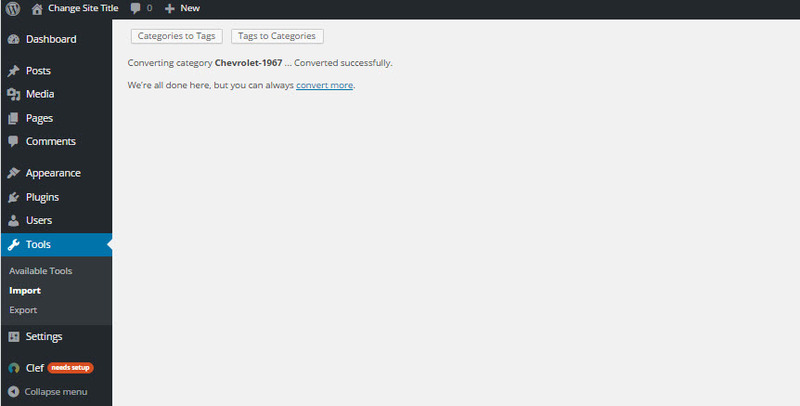 Click on the Convert Categories to Tags button to make the conversion. You will see the confirmation screen that shows what has been converted into a Tag or Category. Congratulations! 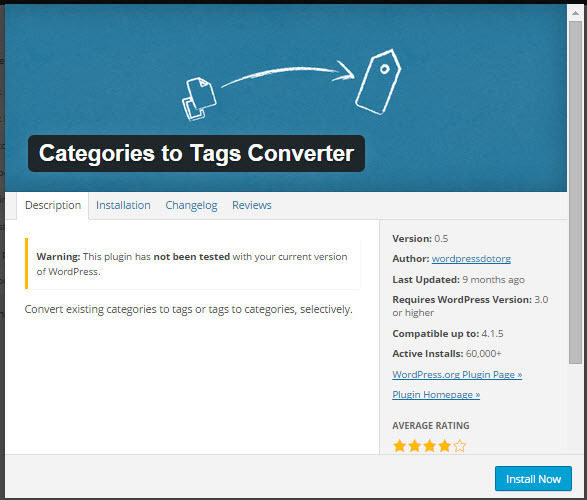 You should now be able to use the Categories to Tags Conversion tool within WordPress. Remember that the tool can be used to convert categories to tags or tags to categories. Check out Understanding Categories and Tags in WordPress and How to Create Categories in WordPress for more information.